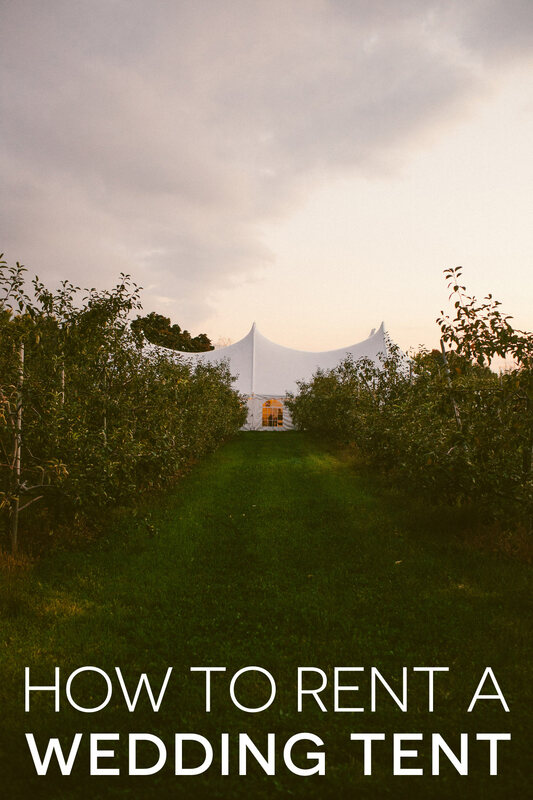 It’s important to factor in whether you will need to rent a wedding tent early on in the planning process. When you’re looking at venues, you’ll want to factor the pricing of the tent into any venue that doesn’t have indoor options. Essentially, if you’re considering outdoor venues and there is more than a remote chance of inclement weather on your wedding date (I think pretty much the entire Eastern Seaboard? ), renting a tent should be lumped into the “book your venue” task on your to-do list. Tents can sometimes be expensive (depending on a number of factors we’ll talk about below), so you’ll want to factor it into the budget before you fall in love with your dream venue. If you’re early in your planning process, you may not have exact numbers yet, and you may not have determined what style of party you plan on hosting (sit-down, buffet, cocktail, punch and pie, etc.). However, you’ll want a rough estimate at this point to get a price quote. This spreadsheet will give you a basic rundown of how much square footage is needed for various types of events. As a general rule, you’ll want to choose the squarest tent your site will allow. A squarer tent will have a taller ceiling, which in addition to looking better will also keep the tent cooler. Also, it’s much easier to make sure that all of your guests feel included when you’re seated in a squarer shaped tent. Hooray. Step one is done! DETERMINE WHAT TYPE OF TENT YOU WANT. There are several styles of tents available for rent—but the most popular are frame tents and pole tents. There are three main considerations to take into account when it comes to which type of tent you rent—space logistics, aesthetics, and (of course) budget. If you have a pretty good idea of the size and type of tent that you want, before getting a price quote it’s important to think about all of the extras that you might need or want. These extras can cause your price quote to vary greatly. Clear top tents are a very popular alternative to white tents and generally don’t cost much more. However, keep in mind that if any portion of your event is taking place during the daytime, the sun can turn your clear top tent into a giant, sweaty greenhouse. Flooring—The options when it comes to flooring are plain old ground with or without a dance floor, or a full floor under the tent. Obviously the ground is the least expensive option, but there are a few drawbacks. If there’s rain in the days leading up to your wedding, the ground can get soggy. Also, plain ground can be difficult for guests to walk/dance on in heels (which is why it’s super important to inform your guests that they would be best served by outdoor-appropriate footwear). If you’re putting the tent on land that’s sloped or otherwise uneven, you may want to consider flooring in order to level things out. Flooring can run anywhere from $1-4 per square foot, which doesn’t sound like much until you do the math! If you can’t afford full flooring, consider just adding a dance floor (which will be far, far less expensive). Lighting—If your wedding is at night, unless you want to give your guests the sensory experience of dining and dancing in the dark, you’ll need some lighting inside the tent. There are tons of lighting options available—everything from bistro lights strung across the ceiling to lanterns to twinkle lights to can lights mounted on the ceiling or theatrical style stage lights with gels. You can also get lighting placed on a dimmer to allow for more mood lighting during dancing. Sometimes couples choose to DIY their lighting—just be advised that the tent company won’t hang them up for you and will require you to remove them before the tent is scheduled to be broken down. Another important thing to consider when you’re mulling over your lighting options is power—if your site does not provide power, you’ll need to rent a generator. Heating and cooling—If the weather is going to be warm, you’ll want to invest in some cooling equipment. Fans tend to be the best option, as tents are notoriously expensive to air condition. Since tents are neither sealed nor insulated, they require a huge amount of power to keep cool with AC—like industrial generator huge. Fans work great to circulate the air and large ones are generally economical to rent. If you’re getting married at a cooler time of year, you can rent a tent furnace with a thermostat to warm up the tent. I’ve had couples inquire about renting patio heaters to place inside the tent, but that makes me super nervous as they can be fire hazards, plus they take up space, whereas a furnace is usually placed outside the tent where no drunk people can knock it over. Now that you have a pretty decent idea of what you’re looking for, you can reach out to rental companies for quotes, but where do you find them? Ask around—your caterer and venue should be able to provide you with some reputable options. Otherwise, a google search for “event rentals + your location” should yield a ton of results—just check out online reviews for an idea of who provides quality service. Also, make sure that you’re okay with the change/cancellation policy. There are so many variables that can change between booking and the wedding, you’ll want the option to change the size of the tent or possibly cancel it if the weather looks like it’s going to be totally amazing. Make sure that those points are covered in writing before handing over any money! When getting a quote ask how long the setup time will take. On average a 40 x 80 foot pole tent takes approximately four and a half hours to set up. If it’s a possibility at your venue, you may want to have the tent onsite and ready to go a few days prior to the wedding—this way you’ll have time to decorate and play around with the floor plan. Find out if the company will come out to survey the land prior to the event. Some companies charge a nominal fee to do so (which is usually counted towards your rental fee if you sign a contract), but you might find the peace of mind worth it! Make sure that the vendor knows the tent is for a wedding (and that you’re expecting wedding quality as opposed to a county fair tent—unless that’s your thing). REVIEW YOUR QUOTES AND BOOK A TENT COMPANY! Keep in mind if you get a quote that seems “too good to be true” compared to the other quotes that you receive, odds are it is. Most rental companies will come in around the same price. Your decision should really boil down to who has the most aesthetically pleasing choices, and who was the easiest to deal with (because that will seriously come in handy later).